The current ensemble consists of Andy Tecson, tenor sax, Ken Jandes, alto sax, Jerry Coleman, drums, Bobby Lewis, trumpet, Stewart Miller, bass and Nancy Hagen, oboe. Singers Kecia Waldschmidt, and Gayle Bisesi often join the band. Douglas Anderson sings as a soloist for the Jazz Psalms. Conductor Justin Sisul and singers Daniel Riley, Jon Negus, Dan MacDonald, Andrew Distel, Lisa Bowker, Matt Bowker, Angel Barrette, Melissa Smithson, Bev Coleman, and Larry Gray, bass, Kirk Garrison, trumpet, Geraldo D’Oliveira, percussion, Jim Ryan, piano, Tim Coffman, trombone, John Moulder, guitar, John Blane, bass trombone and Jerry DeMuzio, alto sax, participate in Bending Towards the Light and/or the Jazz Passion. Past members include Howard Levy on piano and harmonica and Art Hoyle and Mike Mossman on trumpet. Andy Tecson (www.churchjazz.com ) has led the ChurchJazz ensemble since 1982. He has composed the Jazz Psalms, the Chicago Jazz Mass, and set more than a hundred hymns for jazz band and congregational singing. The ChurchJazz band has been heard internationally on the BBC, nationally on CBS and performed at numerous churches and church assemblies throughout the United States, including New York, Minneapolis, St. Louis, Cleveland, Rochester, and Denver. While studying at the Ludwig Maximilian University in Munich, he toured with jazz and pop bands throughout Germany, including Munich, Berlin, Hamburg, Hannover, Stuttgart and Bayreuth. Upon returning to Chicago, he performed with Steve Goodman, Howard Levy and Jump in the Saddle. In 2016 he performed his Chicago Jazz Mass with German jazz musicians at the Kaiser Wilhelm Memorial Church in Berlin. Andy composed the Jazz Passion along with Bobby Lewis and Bobby Schiff, with a libretto by David Abrahamson. The Jazz Passion will be performed in Chicago, New York, Leipzig, Berlin and Slovakia in 2017. Nancy Hagen obtained her masters degree in oboe performance studying with then principal oboist of the Chicago Symphony Orchestra, Ray Still. She is a free lance musician, recording and performing on oboe and piano with orchestras and other ensembles. 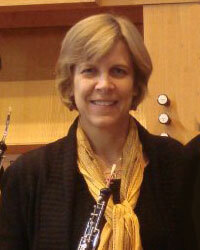 She is the principal oboist of the Park Ridge Civic Orchestra. In addition to playing oboe with the band, she serves as conductor for many of the worship services. She is married to Andy Tecson. 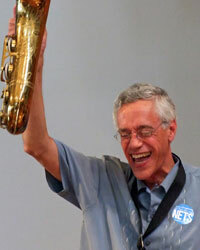 Ken Jandes plays soprano, alto, tenor and baritone saxophone and leads the Ken Jandes Orchestra. 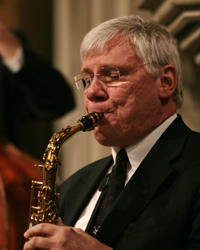 In addition to having taught saxophone at the American Conservatory of Music in Chicago, Ken has performed extensively as both a jazz and classical saxophone player. Dr. Jandes is a former Superintendent of Schools, and currently is Associate Academic Dean and Director of Operations for American College of Education. He is a passionate advocate for linking professional practice to student achievement. Jerry Coleman leads the Nine-Burner orchestra, a nine piece jazz band with a fabulous book or arrangements of great jazz tunes, filled with some of Chicago’s leading soloists. 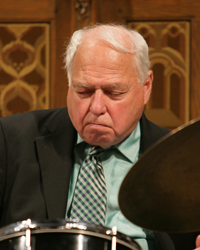 Jerry has performed extensively as a drummer with jazz greats such as Peggy Lee, Zoot Sims, Clark Terry, Herb Ellis, Billy Eckstine, and Teddy Wilson. Jerry is an active studio recording musician. 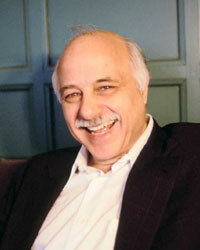 He has recorded works for the Hubbard Street Dance Co., and performed with the Chicago Lyric Opera Orchestra. More information about Jerry is available at www.jerrycolemandrummer.com. Bobby Lewis has played trumpet and flugelhorn in the bands of Jack Teagarden and Tex Beneke, and was the music director for Peggy Lee. 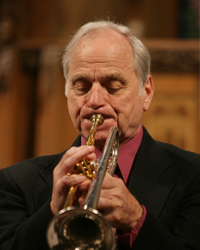 His trumpet and flugelhorn work has made him the top choice for studio recordings and concerts in Chicago. He has played on over 7,000 recording sessions. He has performed with the Chicago Symphony Orchestra, the St. Louis Symphony, Tony Bennett, Frank Sinatra and many others. Bobby is a recording artist on the Southport Label, and is the leader and producer of seven CD’s on that label, all available at www.chicagosound.com. Bobby composed the Jazz Passion alongside Andy Tecson and Bobby Schiff. More information about Bobby is available at www.bobbylewis.com. Bobby Schiff has played on piano with jazz greats such as Mel Torme and Peggy Lee, and participated in L.A. studio sessions with Marvin Hamlisch and Jerru Goldsmith. Bobby has served as a National Trustee and National Vice-President of the National Academy of Recording Arts and Sciences (the Grammy awards organization). 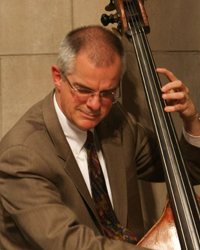 In addition to being a superb leader and accompanist of great jazz vocalists, Bobby records extensively. He arranges for and produces numerous recording sessions both for release as cd’s and for the advertising industry. Bobby composed the Jazz Passion alongside Andy Tecson and Bobby Lewis. More information about Bobby is available at www.bobbyschiffmusic.com. studios, and festivals in and around Chicago. He can be heard on recent recordings by Chicago jazz artists such as Orbert Davis, Russ Phillips, Bobby Schiff, and Judy Roberts, and on Delmark Records 2004 release Up Jumped Spring by legendary trombonist Curtis Fuller.